The self-proclaimed old country doctor watched Jim Kirks nephew withdraw. The man had certainly grown up. But then, where else could he have gone? The others were waiting until he had a moment alone. He needed to say something, and he needed to say it alone. In crystal, like a blasted sleeping prince, was the only man Leonard McCoy knew who literally had been late for his own funeral. By about eighty years. While he wasnt as cried out as he thought, he found the emotions controllable, this time around. 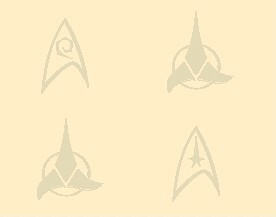 Admiral McCoy hoped that this did not mean he was becoming like Spock, or worse still, that damned android. He decided it was just maturity, though. At last, he found the words. "Jim--Im gonna be joinin you soon enough. When that happens, Im gonna have a question for you. A lot of questions, really. Like how dare you come back lookin so young, when all of us look like--well, not young, thats for sure. But heres simply what I have to say..."
Feeling unsteady even in his hover-chair, McCoy said his piece. Then the others entered, and that old country doctor was very, very glad that he was not alone.